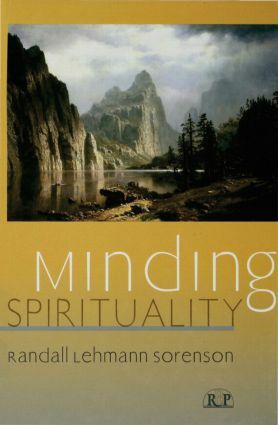 In Minding Spirituality, Randall Sorenson, a clinical psychoanalyst, "invites us to take an interest in our patients' spirituality that is respectful but not diffident, curious but not reductionistic, welcoming but not indoctrinating." Out of this invitation emerges a fascinating and broadening investigation of how contemporary psychoanalysis can "mind" spirituality in the threefold sense of being bothered by it, of attending to it, and of cultivating it. Both the questions Sorenson asks, and the answers he begins to formulate, reflect progressive changes in the psychoanalytic understanding of spirituality. Sorenson begins by quantitatively analyzing 75 years of journal literature and documenting how psychoanalytic approaches to religious and spiritual experiences have evolved far beyond the "wholesale pathologizing of religion" prevalent during Freud's lifetime. Then, in successive chapters, he explores and illustrates the kind of clinical technique appropriate to the modern treatment of religious issues. And the issue of technique is consequential in more than one way -- Sorenson presents evidence that how analysts work clinically has a greater impact on their patients' spirituality than the patients' own parents have. Sorenson brings an array of disciplinary perspectives to bear in examining the multiple relationships among psychoanalysis, religion, and spirituality. Empirical analysis, psychoanalytic history, sociology of religion, comparative theory, and sustained clinical interpretation all enter into his effort to open a dialogue that is clinically relevant. Turning traditional critiques of psychoanalytic training on their head, he argues that psychoanalytic education has much to learn from models of contemporary theological education. Beautifully crafted and engagingly written, Minding Spirituality not only invites interdisciplinary dialogue but, via Sorenson's wide-ranging and passionately open-minded scholarship, exemplifies it. "Minding Spirituality is, in my view, the best book we are going to get on the vexed interplay of psychoanalysis, religion, and spirituality. Sorenson brings a wide and unique range of qualities to his task. Extremely well versed in the intricacies of contemporary psychoanalysis and modern theology, he is a sensitive clinician - as his case studies illustrate - and is also conversant with a range of empirical research, which he draws on to good effect. These several disciplinary perspectives come together in an accessible and readable style. I urge psychoanalysts, psychotherapists, and all others with an interest in the life of the mind and spirit to read this outstanding volume." "Sorenson asks starkly: Does it make any difference if the analyst believes in God? To this narrow question, he gives a wide answer: What matters is that the analyst is open to transcendence, the experience of the sacred, of being a 'soul donor.' Rich clinical and empirical data invigorate Sorenson's thesis." "Randall Sorenson brings together his deep and abiding commitments to psychology, psychoanalysis, and a spiritual/religious life in this thought-provoking, scholarly, yet highly readable work in which he explores the intersection and potential for mutual enrichment inherent in these diverse and powerful avenues for personal growth and transformation. Sorenson's unusual ability to bring to bear on his topic a combination of first-rate scholarship, a sophisticated use of research methodologies, and wise and well-told clinical psychotherapeutic vignettes will make this work of great interest to a wide range of clinicians, helpers and healers of the mind and spirit." Introduction. Minding Spirituality. Ongoing Change in Psychoanalytic Theory: Implications for Analysis of Religious Experience. How Being "Religious" Was Treated in Psychoanalytic Journals from 1920 to 1994. The Patient's Experience of the Analyst's Spirituality. The Analyst's Experience of the Patient's Religion: Clinical Considerations. Psychoanalytic Institutions as Religious Denominations: Fundamentalism, Progeny, and Ongoing Reformation. Psychoanalysis and Religion: Are They in the Same Business?